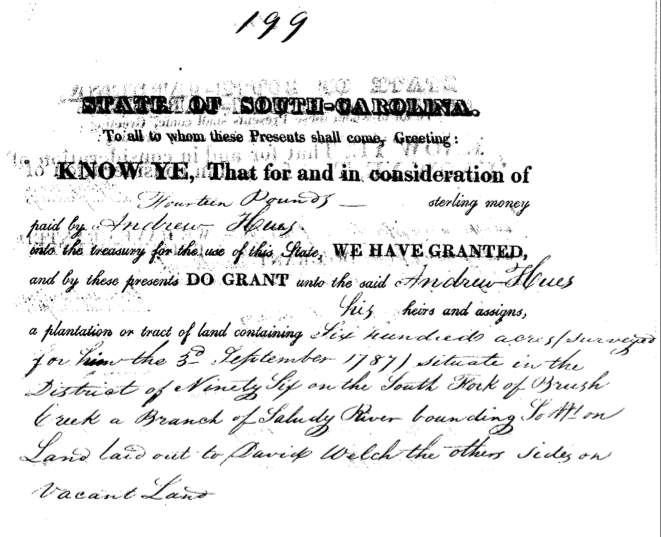 In 1787, 600 acres of land in SC were surveyed for my ancestor, Andrew Hughes. The earliest Hughes ancestor that I can claim with a reasonable level of confidence is a fellow named Andrew Hughes, who was born near Lancaster, Pennsylvania, on April 4, 1755, and died on or about Sept. 1, 1843, in Pickens County, South Carolina. Much of what I know about Andrew Hughes, including the locations and dates of his birth and death, is recorded in documents related to two separate pension applications he filed for his service as a militia soldier in the American Revolutionary War. He applied for a pension from the state of South Carolina in 1826 and received payments from the state until 1834, when he applied for and was awarded a federal pension. According to his federal pension application, Andrew was living in Orange County, North Carolina, when he joined a North Carolina militia unit that formed in Caswell County soon after the Declaration of Independence was signed in July 1776. Some of the campaigns and battles that he took part in were the Rutherford Expedition, Cross Creek (I believe this refers to the battle at Moore’s Creek Bridge), Camden, and Brier Creek. By 1787, Andrew had settled in the Ninety-Six District (later called the Pendleton District) of South Carolina and he then lived in that area for most of the rest of his life. A land grant record shows that 600 acres of land along “the south fork of Brush Creek” (now known as Brushy Creek) were surveyed for him in September 1787. I believe that this land was probably located somewhere between the present-day town of Easley, S.C. and the Saluda River. Andrew and his first wife, Obedience Sumner, had several children together; I’m not sure of the exact number. (I do know that I am descended from one of his sons, Elisha, who was born in the Pendleton District about 1800.) Obedience died in 1829. Then in 1835, when Andrew was 75 years old, he married Nancy Mauldin, who was 63. It was a second marriage for her as well. Andrew and Nancy moved from the Pendleton District to Gwinnett County, Georgia, in 1835, apparently so they could live closer to her children. But the move to Georgia created a problem for Andrew: In 1836 he had to travel back to South Carolina to collect his annual pension payment because there was no other way for him to get it. But while there, he was injured in a fall from a horse. After that, he never returned to his second wife in Georgia. He died in South Carolina seven years later, in the house of one of his sons, Charles Hughes. Twelve years after Andrew’s death, Nancy filed an application seeking both pension benefits and bounty land as Andrew’s widow. Her application was contested and was the subject of much legal wrangling for more than a year before she was awarded a small pension of $40 a year. Andrew Hughes returned to South Carolina in the forepart of the next Summer Sometime in June; his Hughes sons all living there in S Carolina Kept the Old man there he being very feeble and old & injured by a fall was not able to return to his family without help which his sons would not afford him, being a drunken set, & perhaps kept him there in order to git his pension money; he being very anxious all the time to return (???) Nancy Hughes then with her children & being very old & infirm could not go back to him in consequence of Bad Health and for want of means. Note: The above is from my own transcription of the letter. (???) means I could not decipher what was written in that space. There is still a lot that I don’t know about Andrew Hughes. For example, I don’t know who his parents were, and I have never seen a portrait, drawing or any other likeness of him, so I have no idea what he looked like. But this much I do know. Hundreds and perhaps thousands of descendants of Andrew Hughes, myself included, are alive today. I personally know of Hughes families in upstate South Carolina, northeast Georgia, the area between Tuscaloosa, Ala. and Columbus, Miss., and in Jacksonville, Fla. that can trace their lineage to him. There are probably many other Hughes families descended from Andrew that I am not aware of. Perhaps one day we will be able to trace the line back to Andrew’s parents and even farther. I certainly hope so! Andrew Hughes is my GGGG Grandfather. Thank you for this information! I am descended from his son James W Hughes. Thanks, Laura! If you are descended from Micajah, then I’d love to hear from you. Feel free to email me at tahughesnc@gmail.com. I just stumbled across your blog and am loving it! In researching my Hughes line ( my dad’s a Hughes), I find that we descend from a J.R. Hughes, who is suppose to be a son of Micajah, who married Mary Johnson. I loved reading this blog about Micajah. I reside at near the GA/SC border and plan to do some “footwork” soon, including a run up to the SC Department of Archives and History, tomorrow. Would love to connect with you in regards to more family info. Traci, what does the J.R. stand for? I don’t have any info about him. Your Andrew and my Robert Wood(s)b1783 are closely related. Your Hughes relatives would certainly have came from County Monaghan Ireland.